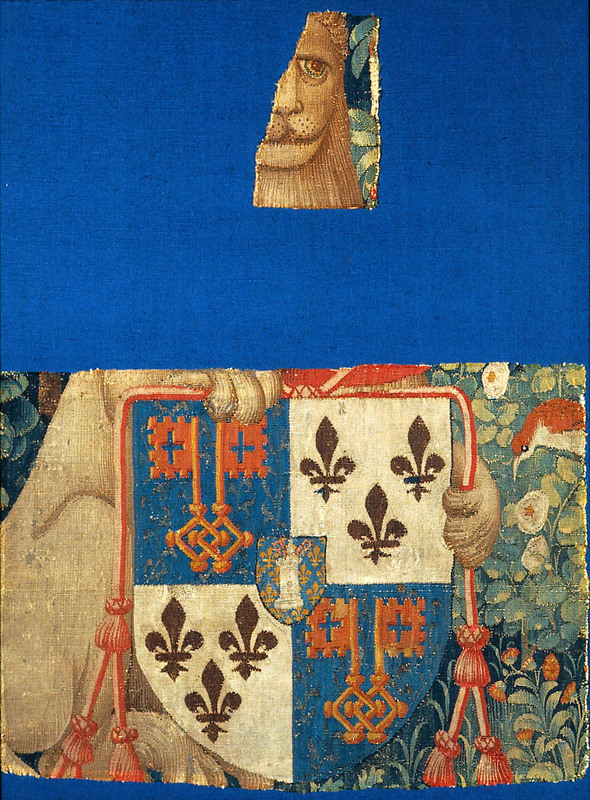 Fragment depicting large shield quartered in the first and fourth with arms of Ferry de Clugny, in second and third with younger branch of Arschot. Part of lion which held shield and part of cardinal’s hat which surmounted it can be seen. This is part of the Penelope tapestry. Charles-Antoine was a direct descendent of Hughes, the youngest brother of Ferry de Clugny (see "Eight Fragments of Fifteenth Century Tapestry," Gertrude Townsend, in the Bulletin of the Museum of Fine Arts, Boston, vol. XXVII, no. 159, February 1929, pp. 3). Townsend's article also provides a summary of the provenance of these fragments as she understood it, having taken her evidence from an anonymous manuscript found in the Chateau de Terrebasse, Isere, and published by the Vicomte L. de Varax, as "Les Tapisseries du Cardinal de Clugny," in Lyon in 1926. This consitutes the only known source for their complete provenance. According to notes on the previous provenance, the tapestries remained in the Chateau de Thenissey until 1791 when they were taken to the Chateau de Jour near Bagneux-les-Juifs. They were then seized and sold at auction in 1793. It has not been possible to confirm or refute this assertion. However, it seems unlikely because they remained with the de Tulle family in the Chateau de Thenissey. The citation (Jubinal, 1849, VII) has not been located. According to de Varax, these fragments are all that remains of a series of ten tapestries comissioned by the Cardinal de Clugny representing the stories of virtuous women that was destroyed in 1791 in a fire at the Chateau de Thenissey (pp. III). His text does not mention any 1793 sale.